In class and in the field workshops that will focus on key topics that may be found on the field tests. Review of the oral presentation scenario judging criteria and presentation tips. the 2018 top three North American Envirothon team oral presentations on video (Idaho). Resource people who will meet with teams at their school, work place, or in the field. April 13, 2019 – Team Training Workshop – Location: Maritime College of Forest Technology (1350 Regent Street, Maritime Forestry Complex). Dendrology and Wildlife hands-on Labs. Scenario Questions and Answers. March 18th, 2017 NB Museum, Saint John– Team Training Workshop Current Topic (Sustainable Agriculture) and Oral Presentation Tips, Judging Criteria. April 28th, 2017 – Location: Maritime Forestry Complex (1350 Regent Street, Fredericton – meet in Lobby) 9:15 am – 2pm. Field Day – Soils (soil pit), Forestry, Aquatics, and a presentation on the current topic. Thank you to the Fundy Model Forestry for organizing this workshop with funding from the NB Wildlife Trust Fund. Forest Mensuration Questions – From Forestry Station presented by Bernie Daigle and Nairn Hay. May 7, 2017 – Team Training Workshop -ECOFEST 2017, Location: Irishtown Nature Park, Moncton 8:30 am- 3:30 pm. Please contact pamela.fowler@nbed.nb.ca to register. Envirothon NB Curriculum Guide – This document links the Envirothon NB Learning Objectives with the Atlantic High School Science curriculum. 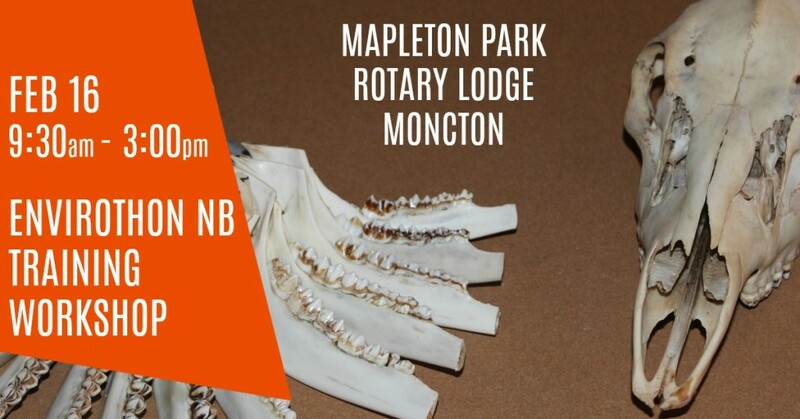 May 16th, 2015 Spring Workshop – Irishtown Nature Park, Moncton (mainly hands-on with Forestry, Wildlife, Aquatics, and Current Topic)Details – ECOFEST 2015 To register for this workshop, please contact Pamela Fowler (pamela.fowler@nbned.nb.ca).